The CasinoCat reviews Party Poker, online poker room. Play multiplayer poker for real cash against other players all over the world! Party Poker is the latest craze in online gambling, they have been featured lately on the Travel Channel's World Poker Tour and are considered the Internet's fastest growing card room. Receive up to $100 free on sign up! Party Poker is the hottest online poker room on the Internet right now. They're all over the place including broadcasted tournaments on the Travel Channel. (They're the first gaming company to advertise on national TV). At Party Poker you play other real poker players from all around the world so there is no house advantage (the house does take a small cut of each pot to maintain a profit). So if you've got the skills you think you have, now is your chance to prove it to the world! 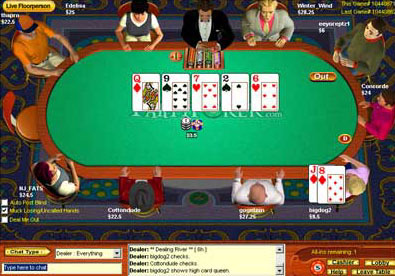 A nice variety of games are also offered including Texas Hold 'em, Omaha, Omaha Hi/Lo, 7 Card Stud, and 7 Card Stud Hi/Lo, and different betting limits for all the poker games for different level players. The bottom line is, CasinoCat recommends Party Poker over any other card room on the Net. 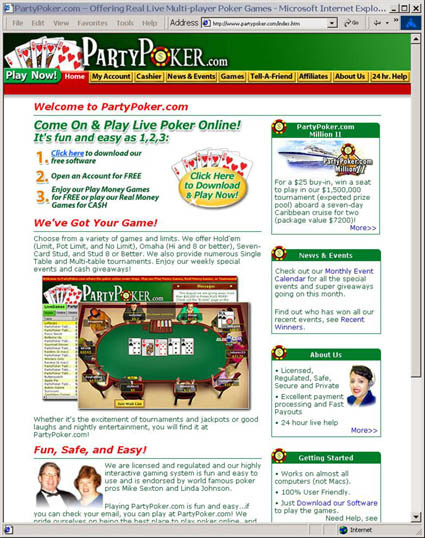 Click here to visit Party Poker!